To most people, selecting and installing a safe sounds easy. You walk into a store that sells one, choose the size you want, take it home and start using it. Have you, however, stopped to consider who saw you bring the safe home? Who helped you install it in a safe location? Who observed you using it? What are you going to store in it? If you’re not sure then start by considering what are your most valuable possessions. — Documents (property, identity, vehicle, legal work, etc). — Jewellery (is it in boxes or can you convert to collapsible pouches that can be stored in a smaller safe). What type of safe should it be? Floor safe: As the name suggests it is installed on the floor. These are heavy safes and can’t be easily moved and are good for storing heavier items. Wall safe: Commonly found in hotel rooms these are ideal for storing documents and smaller-sized valuables. Weapons safe: These are built from stronger material, with additional locking devices to ensure the integrity of the weapon. While choosing the size, the decision is based on what you want to store in it. Often, the most forgotten element is whether the safe will fit in the space you plan to keep it in. If you are installing a large one then consider the width of the doors and if it will pass through with ease. Take into consideration that larger safes should be placed on the ground level if you are living in a multi-storey home. The larger the safe the heavier it is and it may require specialised lifting equipment to be taken to a higher floor. — Is it vandalism by unauthorised persons? — Is it water damage (flooding in the home)? Assess the most likely risk and then choose a safe that affords protection from it. The most common damage to safes is from fire. 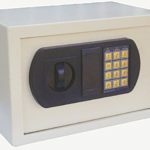 Average prices for a basic safe model can start at Rs5,000 and can touch Rs500,000 based on the added protection such as multiple locks, thicker metal, fire, waterproof, etc. So what is the right range? Choose a safe that provides protection at less than the value of the items stored in it. Assessing the value of your items doesn’t necessarily imply a monetary value. The cost of effort and time in replacing the item should be considered as well. What type of locks should it have? Dial locks — are a sturdy system that afford you more reliability as there’s no chance of electrical failure. However, setting the combination requires professional help. Digital locks — these are commonly found in hotel rooms. To open it, you key in a pin code. The downside is that they require batteries and you need to regularly replace them. Digital locks are far easier to operate than dial locks and if you ensure regular battery checks then they should be your preference. Bolt it down. Safes, especially wall types, come with grooves that permit you to bolt it in place. A stronger safe is one that can’t be taken away. Choose a location that is not a common hiding place. (Bedroom closets are common and usually searched by intruders). Don’t operate the safe in the presence of outsiders (domestic help, friends or even relatives who don’t live with you). Don’t give access to young children, especially if you keep a weapon in it. The fewer people in the house are aware of the safe the better. The rationale being that what they don’t know they can’t tell someone. The safe should be stored in a place that can also be locked. Multilayered security adds to the efficacy of the system. If you’ve identified a safe or panic room in your home then the safe should be placed there. Remember don’t secure your safe to the extent that using it becomes a hassle. The tendency then to not use it rises. Yet make sure that the safe is also not easily accessible to anyone. If, for example, your domestic help has unsupervised access to your wardrobe then that’s not a place you want to keep it. There’s no regulatory guideline on the limit of the value of products to be stored in a safe. To claim insurance for items, lost it would be important to obtain an appraisal value especially of gold ornaments. For all other items purchase receipts should be available. Remember, don’t store these receipts and insurance documents in the same safe as the valuables; keep them in a different secure location and make both digital and hardcopies as backups.